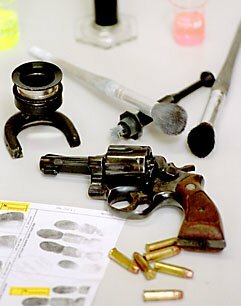 Identifying evidence in a systematic crime scene examination is the hallmark of a highly competent forensic examiner. Scenes-of-crime officer (SOCO) trainees are taught these skills in order to prepare them for their future career in the New South Wales Police Force. The ability to assess and examine a crime scene or incident through the gathering of all available information from various sources is extremely important. Those officers who undertake the job of being a scenes-of-crime officer are trained at the Goulburn Police College for a period of time, and also trained in the field as well. All personal are trained in certain modules, which include finger print gathering, and associated photography, also crime scene and general photography, crime scene examination and evidence preparation, plus court presentation. They also attend lectures in associated support disciplines by other government departments and private industry. During the course every officer performs work at his/her station providing the opportunity to put into practice their crime scene studies. Trainees are also taught about DNA. 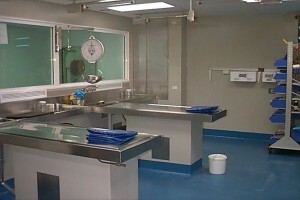 This requires working with pathologists and biologists on post-mortem examinations. This prepares trainees for a very important part of crime scene work, being involved in cause of death investigations and gathering of forensic samples, including DNA samples from scenes for identification purposes. Fire scenes and explosion examination skills are other important areas of study and include the ability to recognise suspicious fires so that the expert fire scene examiners of the New South Wales Scientific Unit can be called to further investigate the scene. Further crime scene examination skills learnt include recording and collection techniques, ballistics and tool marks study, vehicle identification, blood splash examination, shoe and tyre impressions and examinations and recording, analytical support services and document examination considerations. About 60 per cent of a SOCO’s workload involves making fingerprint examinations at crime scenes. Trainees are therefore instructed in the various examination techniques and processes involved in developing latent and other fingerprints. They study the composition of the fluids that make up latent and visible fingerprints, fingerprint patterns and various characteristics of fingerprints and the surfaces on which they may be found. As in all police work the documentation of the examination and the following of the correct chain of evidence are integral elements in the training of SCOC’s. Study and training also is undertaken in the fingerprinting of unidentified deceased people to aid identification. Photography and video recording knowledge and skills are part of the SCOC training. The subjects covered include the use of police still cameras and video equipment, practical photographic and video exercises in colour and black and white photography and other specialist photography. 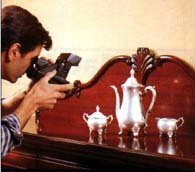 A study of the characteristics of light, images and illumination are important areas of the photographic science, as light and its characteristics, and its ability to convey recordable images, are integral to the study of photography and its use in police forensic work. To complete the SOCO course officers are assessed on crime scene examination skills and knowledge, the preparation of evidence for court. Those officers who successfully complete the course are than transferred to a scenes-of-crime unit to undertake on-the-job training and assessment. They are also required to undertake a major research assignment and successfully complete it within a required period of time. Once this has been completed they are assessed as to whether or not they are classed as a competent crime scene examiner or not. The workload of a SOCO is often high and it is important for the officers to have suitable temperament and disposition to deal with, at times, abhorrent and distasteful scenes and investigations. It is also important for officers to continue their police studies and specialist training in order to keep abreast of new methods and continued knowledge and skills development for them to progress to the higher positions in the specialist field and other policing areas.